I am a creature of habit and one who finds comfort in the reliable coming of the seasons. Every year without fail, a month or so before Easter, I will pick up a packet of hot cross buns with my groceries. Like mince pies in November and strawberries in June, I buy hot cross buns to ring in a new season. At this time of year it’s with spices, plump currants and signature piped flour crosses. 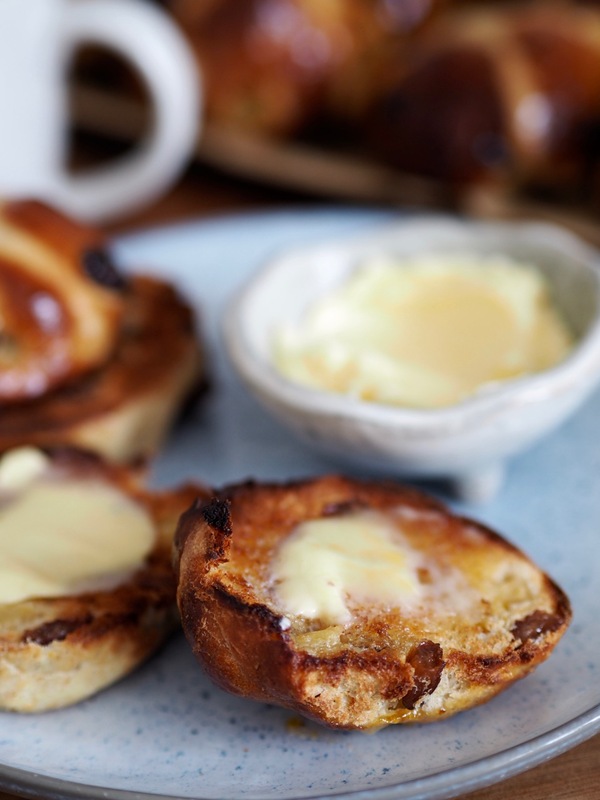 Even though the purchase of hot cross buns is special, limited to a short window of time, quite often I eat these shop-bought buns mindlessly in one less layer, without thick bed socks and as blossoms burst riotously into bloom. I eat these buns as part of an annual routine, to herald a new phase of the year. In previous years supermarket buns have played their part: a component in the sensory representation of spring. I hadn’t noticed before, perhaps I had been so entranced by sweet-smelling blossom, the sight of gambling lambs and the kiss of warm air again on bare skin, that supermarket hot cross buns are sadly disappointing. This year I noticed and was left deflated by these buns, forlornly flat, meanly spiced and scant on raisins. I’ve found if you spread them thickly with butter and jam and you can just about get away with these flat, sparsely-raisined numbers, but really at this point they’re just a vehicle, no more special than a hurried piece of toast. Such buns would not do for this eternal romantic and creature of habit, craving a taste of spring. 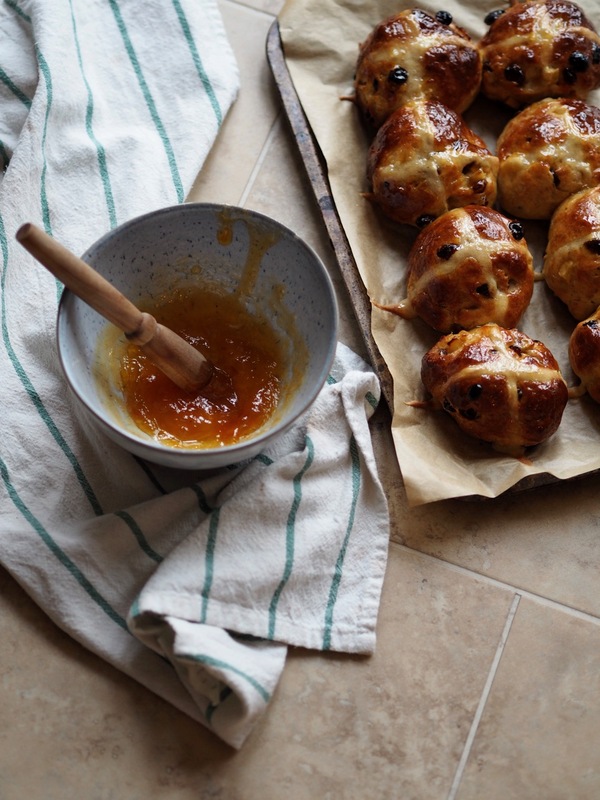 When I imagine Easter buns they are lumpily plump with too much fruit, almost as round as oranges and shining merrily with a glaze of apricot jam. So these buns – my hot cross buns – are cut from a different cloth, or kneaded from a different dough, rather. They are luxuriously heavy with plump raisins and fresh apple, spiced decadently and without reserve, and the sweet, soft dough is buoyantly robust and springy once baked. They leave your tongue tasting of orange zest and fingers sticky from impatient, craving manhandling. These are the buns that say Easter. They say spring, the coming of summer and the promise of abundance to come. And when toasted and spread thickly with soft salted butter starting to melt, they are also impossible to eat mindlessly. That was never the way to eat Easter buns, really. Treat these hot cross buns as you would a Christmas pudding and customise to your taste depending on your cravings this year. If you’re yearning for traditional mixed peel in your bun, there is nothing to stop you from adding it in. In my next batch I’ll be swapping the apple for the zest of another orange and chopped dark chocolate for an unorthodox (but I’m sure completely delicious) chocolate orange Easter bun. This recipe makes 15 buns. They freeze well, if you find you can’t polish off the lot over a couple of days. This recipe requires 3 approximately 1 hour proves. You could do the second prove in the fridge overnight if desired. In a medium saucepan bring the milk to a boil. Remove from the heat and add the butter. Set to one side to cool. Put the flour, salt, sugar, yeast and spices in a bowl or bowl of a food processor with a dough hook and mix until combined. Make a well in the centre of the flour mix and pour in the cooled milk and egg. If you are using a food processor with a dough hook, let it run on a medium speed for 5 minutes until the dough is thoroughly combined and is smooth and elastic. If you are working by hand, mix together with a wooden spoon before tipping out onto a lightly floured surface and kneading by hand for 5 minutes. Put the dough in a lightly oil bowl, cover with clingfilm and leave for an hour or until double in size. With the dough still in the bowl, add the raisins, chopped apple and orange zest. Knead into the dough, making sure the fruit is well dispersed. Leave to rise again for an hour covered with an oiled piece of clingfilm. You can do this second prove in the fridge overnight, if you like. Divide the dough into 15 pieces of approximately 80g each and roll them into a smooth ball on a lightly floured surface (I weighed each piece of dough before I rolled them, to ensure evenly sized buns). Arrange the buns on two baking trays lined with greaseproof paper and cover for a final hour with oiled clingfilm. Make your cross mixture by combining the flour with 5-6 tbsp water until you have a smooth but thick paste. Once your buns have completed their final prove, pipe crosses on your assembled buns. Heat your oven to 200c and bake for 15-20 minutes until the buns are an even, golden brown. A couple of minutes before the baking time is up gently heat your apricot jam or syrup. Remove the buns from the oven and brush the glaze over them whilst they’re still warm. Best served toasted with plenty of salted butter.